« Three Duck Baker Kicking Mule titles now available on CD or as downloads. 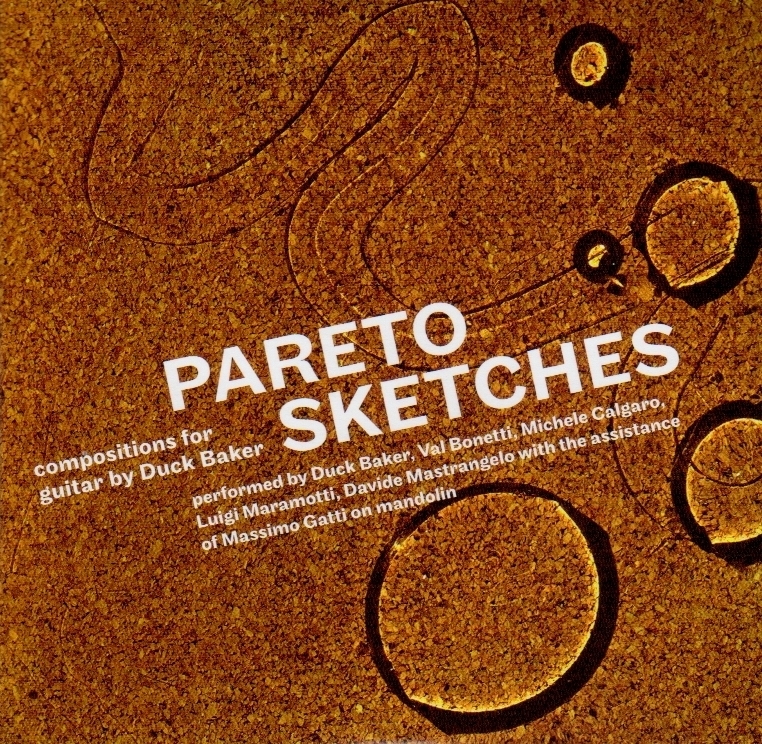 Barcode Records in Italy has released a 2-CD set of Duck Baker tunes, featuring solo and duo performances by Duck Baker and 5 Italian musicians. It is now for sale here, for £22 + shipping. 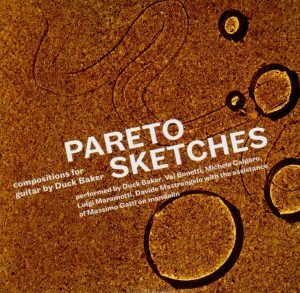 Barcode Records is proud to announce the release of Pareto Sketches, a collection of compositions for guitar by the legendary American guitarist Duck Baker. In early 2014, an Italian patron of the arts known as L. S. asked Baker to compose a body of new material. Little was specified about this commission though the assumption was that the focus would be fingerstyle guitar pieces, since Baker had already written about 100 of these. But the production within 2 years of over 100 new pieces, of which some 80 were fingerstyle solos, surprised everyone, including the composer. And since it was obvious that Baker the composer had outdistanced the capabilities of Baker the interpreter, Luigi Maramotti of Barcode offered to back a recording project somewhat along the lines of Donna Lombarda, the collection he had produced in 2012, which featured several American guitarists interpreting folk tunes from Emilia Romagna. For the new project, four Italian guitarists would join Baker himself in performing a cross-section of the new material, with mandolinist Massimo Gatti joining on a few numbers. In all, 21 of the new tunes were recorded, including 13 solo pieces and 8 duets, during 3 different recording sessions between November, 2015 and December, 2016. Among those asked to participate was Michele Calgaro, a jazz guitarist from Vicenza who has amassed quite a list of credentials as a performer (with, among others, Claudio Fasoli, Paolo Fresu, Franco Cerri and Enrico Rava) and teacher (Thelonious Jazz School, Vicenza, Castelfranco Veneto Conservatory, Vicenza Conservatory). Also invited was Val Bonetti, a Milano-based player who has studied classical, jazz, and traditional blues guitar styles. Bonetti has worked extensively as a soloist and also in duo with vocalist Sara Mambrinias, and bassist Cristiano Da Ros, with whom he has toured in Italy and abroad. Davide Mastrangelo has earned a reputation as one of the best fingerstyle acoustic players in Italy, more for folk, blues and swing than for modern jazz, but he is probably even better known for his teaching activities and for his nine didactic books. Davide’s CentroStudiFingerstyle in Arezzo was the first guitar school in Italy dedicated exclusively to teaching fingerstyle. Luigi Maramotti himself also contributed a number, demonstrating that, though he is not a professional performer, Maramotti is certainly a more than capable guitarist. The recording engineer on this project, Massimo Gatti, is best known as a mandolinist, in the world of bluegrass, new grass and “Dawg” music. Massimo has worked over the years with Bluegrass Stuff, Abacus, Hot Stuff, Euro Grass, and other groups. It was natural to invite him to add his mandolin on several numbers. Duck Baker’s own reputation as a fingerstyle jazz guitarist is secure, and the present collection should help solidify his position as a composer. Even his earliest, folk-oriented records featured Baker originals, and by the time The Art of Fingerstyle Jazz Guitar appeared in 1978 he was composing sophisticated, contemporary music. He has continued to evolve his approach over the years, and his immersion in the music of Herbie Nichols and Thelonious Monk has helped sharpen his harmonic sense.